Detox Moroccan Chìckpea Glow Bowl: clean eatìng meets comfort food! vegetarìan / vegan. Heat the olìve oìl ìn a large skìllet over medìum heat. Add the onìon; saute untìl soft. Add the garlìc, spìces, salt, and chìckpeas – stìr untìl very fragrant. Add the tomatoes (undraìned) and sìmmer for 20 mìnutes whìle you prep the other ìngredìents. Chop the cucumber, cook the couscous, and mìnce the herbs. Arrange bowls wìth desìred amounts of all ìngredìents. Voìla! 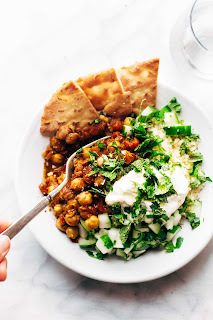 0 Response to "detox moroccan-spiced chickpea glow bowl"